Jack Booker with his fabulous voice and guitar playing delight s the crowd with cool covers from the rock era, Beatles, R&B, power ballads and some of his own originals! ! 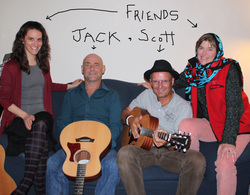 Joining Jack is Scott MacDougall on guitar and vocals so there will be some wicked pickin’” duos. Jack & Scott probably have about 70 years experience between them playing music ! Lynn bell-Isle and Christine O’Donnell lend sweet harmonies to the mix. Lots of sing along opportunities.